I finally received the e-mail I've been dreading all month. A wonderful reader wrote this, "Hey, aren't you supposed to be working on hand-print gifts this month?" I was hoping that no one actually remembered that. You may have noticed that my self-diagnosed adult ADD kicked in, and I got totally distracted by the pretend and play mommy (or daddy) set. Just when I got the obsession/distraction out of the way, a new one took its place . . . SCARVES . . . warm, fuzzy, comfy scarves! Don't roll your eyes at me . . . I know it's fall. I also know that fall just officially started last week. And I do love fall, but I also love scarves . . . in fact, my love of scarves might be the only thing that gets me through winter. Last year my kids were always asking me why they didn't have any scarves of their very own, so this winter I've vowed to remedy that situation. In fact, I'm pretty sure I'm over-compensating this year because this tutorial for the Button Scarf is the first in a series of what will be three different scarf tutorials. Three? Yes, three! Aaack . . . this is defintely my new obsession. 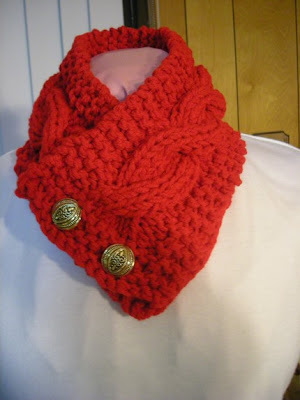 I'm in love with these buttons scarves I saw here and there last winter! *Here's the deal with bamboo felt . . . it is so soft; however, it also shrinks a tiny bit if drycleaned and a little bit more than that if machine washed. If washed super frequently, it also will break down a little bit faster than fleece. So . . . I chose dark colors for this scarf so that it wouldn't need to be washed very much (gasp), and I plan to hand wash and hang dry to manage shrinkage. If this is a concern for you, just use fleece for the entire scarf. 2) Pin strips together in your own unique color combo. 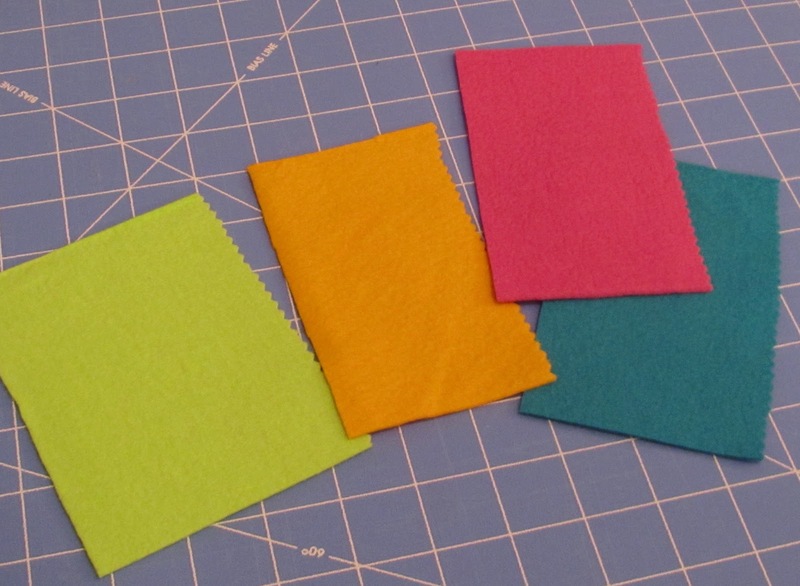 The edge that has been cut with the pinking shears should be on top. 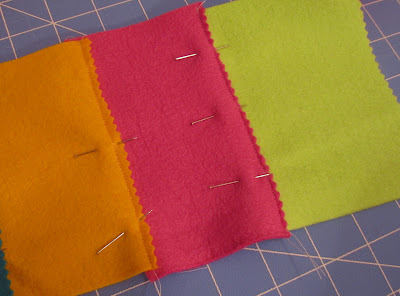 Sew strips together close to pinking sheared edge. 3) Turn over and trim straight edges on back side of scarf. 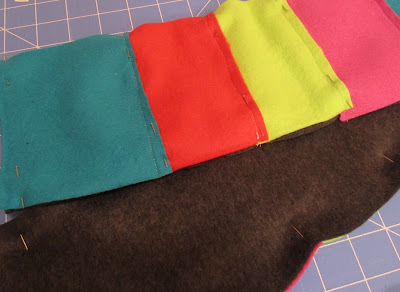 4) Pin wrong sides together to a strip of fleece the same size of your strip that is pieced together. 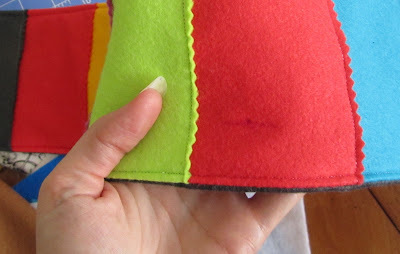 6) Sew around fleece/felt combo leaving two inches for turning. 7) Turn. 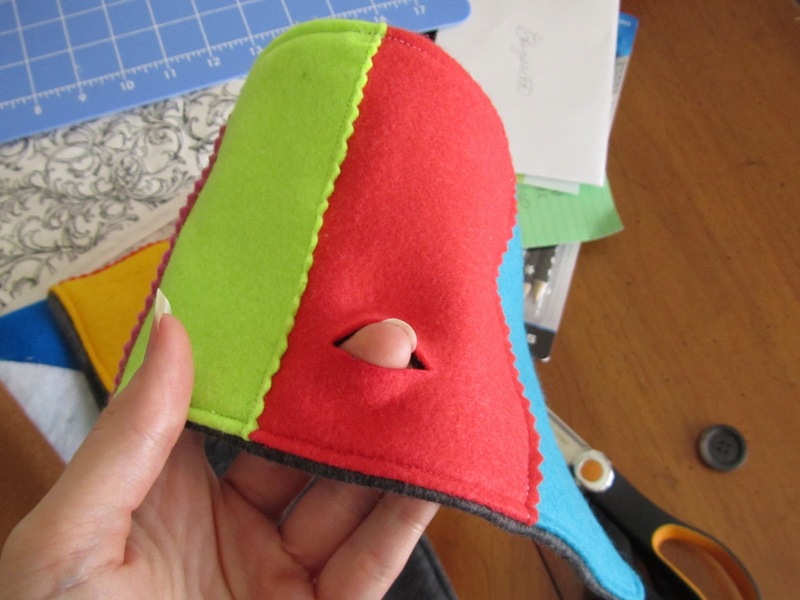 Fold in opening and pin shut. 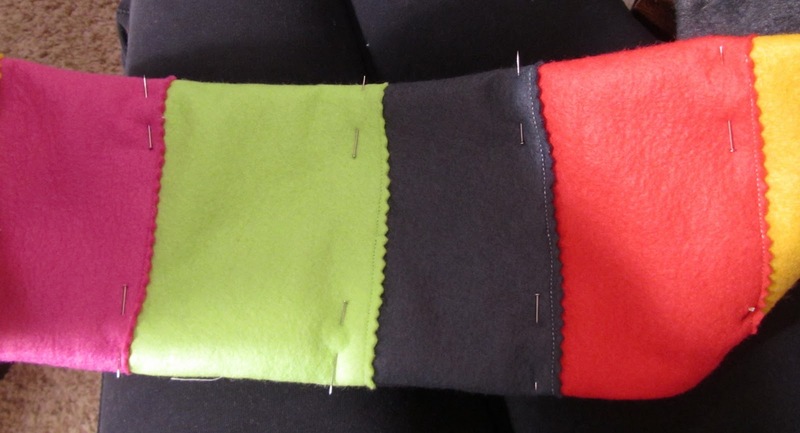 Pin around and top stitch around edge of scarf closing up opening as you go. 8) Figure out where you want your button by trying on model or self. Mark with disappearing ink. 9) Cut slit just big enough for your button to fit through. 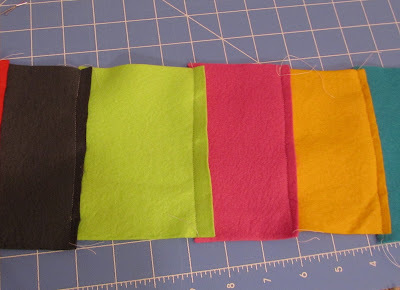 10) Sew around all four sides of slit. You could use your button-holer on your machine, but frankly I'm lazy and that thing scares me, so this is my method. Check out some of the great parties I may link to by clicking on the blog name below or visiting my "I like to party" page that shows off all the party buttons. very cute Elizabeth! 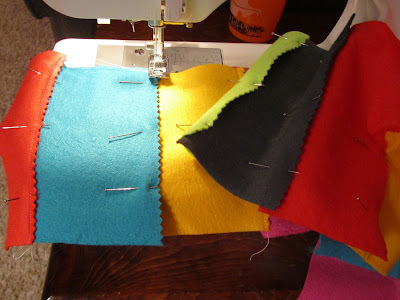 I love your "fake" button hole - perfect for non-fraying fabrics! The button holer on my machine scare me too! Aw, how sweet! Nice job! Love your version! So cute! I love this scarf! The color stripes are so cute. And I love the little button closure. How is it that everything you make I want to make for my nieces. I need to do some weeding down here. 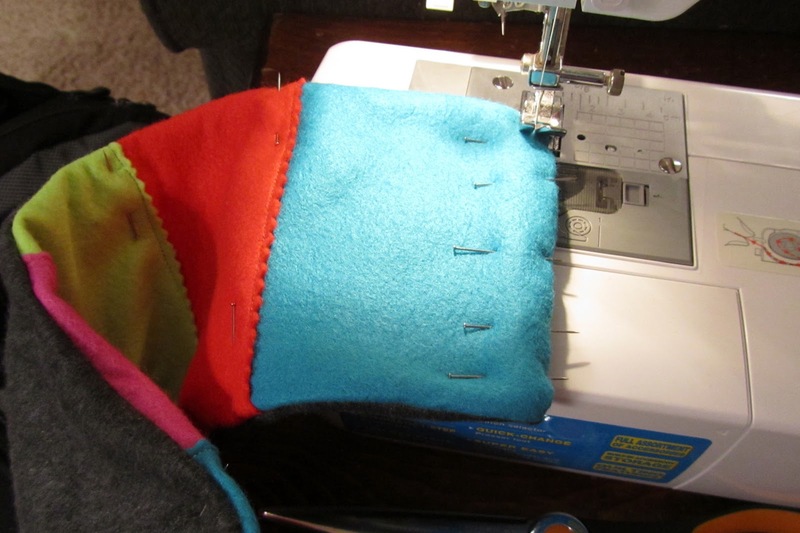 Or actually sew something. ha. 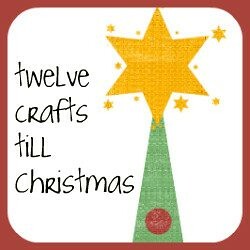 I found your blog a while ago and just love all your ideas! But, I just recently saw your blog again over at New Friend Fridays at The Trendy Treehouse. I love the fleece scarf! Must be something in the air, I made a scarf this week too! nice blog you have, glad to be here. following you from New Friend Friday by Trendy Treehouse. cheers! That is so cute! What a great solution to kids scarfs. It stays in place, easy to close up and no tripping up on or dragging scarves behind. Love it! I love this! I don't knit, so I've never made a scarf, but I do sew. I'll be making one of these for my daughter. Thanks for sharing! Great project! Perfect use of that Bamboo felt! What a great idea! I found you through Its So Very Cheri. Thanks so much for sharing. Saw you on Its So Very Cheri. 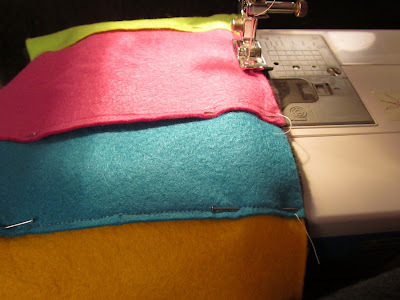 Love the bold fleece colors you used. Makes the scarf so festive and fun! So very pretty! 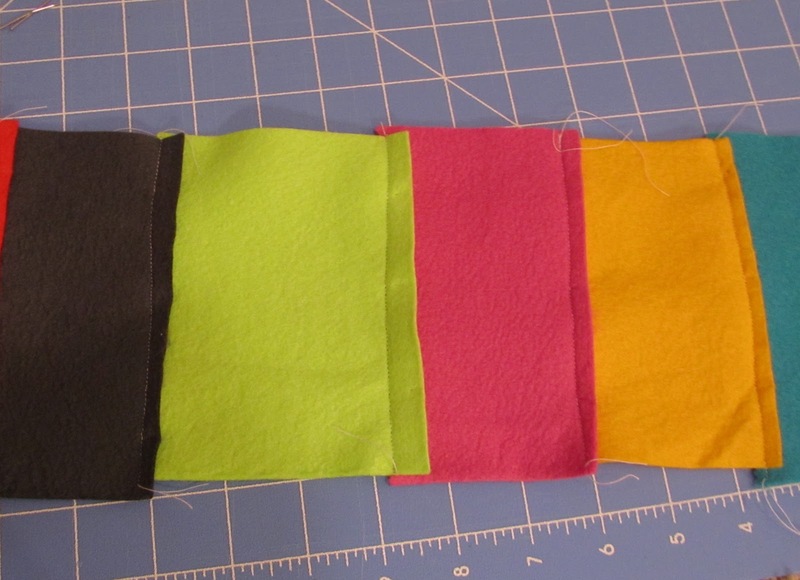 I've been meaning to experiment with bamboo felt soon. Love your blog! I love this! You always have the best ideas! 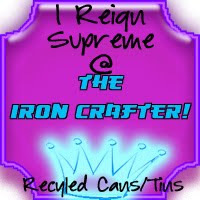 Come by and check out my giveaway this week!! Love these! Thanks for stopping by and linking to Anything Related! I love your colorful scarf! I just started wearing scarfs with my jackets last year and I would love to have one like this! 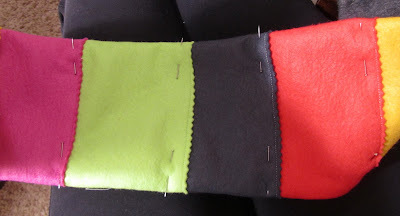 Maybe I will find time to make one before it gets too cold. Thanks for the great instructions! I am visiting from It's So Very Cheri tonight. 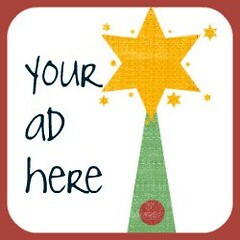 You should enter that in thediyclub.com "Weekly Showcase" party. We have a fun give-a-way each week this month. SO CUTE!!! I love the button and the bright colors are great. Wonderful tutorial! Great job! I love this one too! Thanks for linking up for Friday Favorites last week!